Ornette Coleman (saxophone, trumpet, viola); Al Mac Dowell, Tony Falanga (bass); Denardo Coleman (drums). 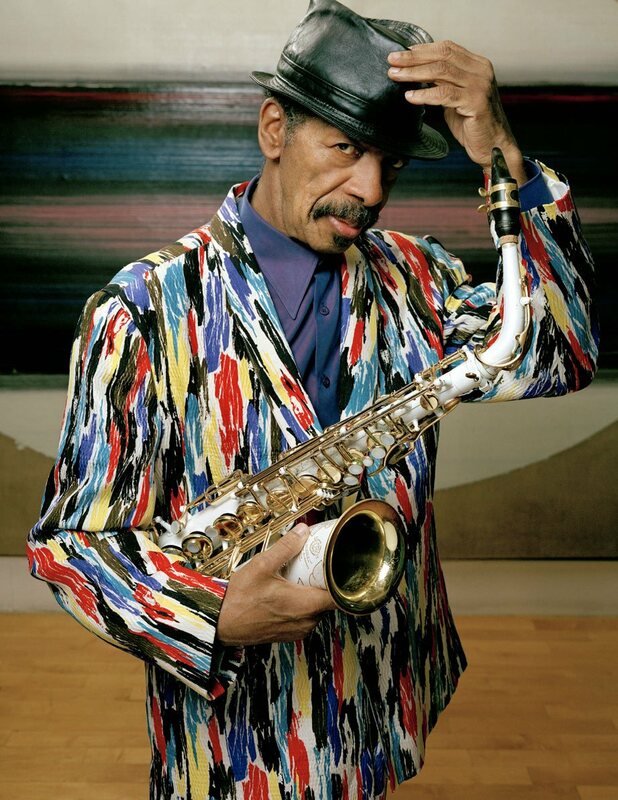 It's no surprise that pioneering musicians like Captain Beefheart and Frank Zappa were wild about him because what saxophonist and composer Ornette Coleman (1930) did from the fifties onward, rocked in a big way. He turned the jazz world upside down with his radical views about harmony and melody, and by introducing collective improvisations and his impact was felt on the pop scene as well. Without Coleman's free jazz, entire generations of jazz musicians would have sounded much more boring. Over half a century later, Coleman's music is just as fascinating as ever, among other things because he always uses his virtuosity to enhance the strength of his melodic and emotional expression. Coleman was born in Forth Worth, Texas. At age fourteen, he taught himself to play the saxophone and read music, and from age nineteen he performed with various rhythm & blues bands. In 1950, Coleman arrived in Los Angeles where he came into contact with jazz. It was here that he formed the legendary Ornette Coleman Quartet with Don Cherry (trumpet), Billy Higgins (drums) and Charlie Haden (double bass). He recorded his debut album Something Else (1958) with this quartet. More classic albums followed including The Shape Of Jazz To Come (1959) and This Is Our Music (1960). Coleman also immersed himself in the rhythmic and hypnotic power of African music and with Prime Time he explored the boundaries of funk. In 2007, Coleman was honored with a Grammy Award for his entire oeuvre and in that same year he won a Pulitzer Prize for the album Sound Grammar. His current quartet consists of himself, his son Denardo Coleman on drums, Al MacDowell on bass guitar and Tony Falanga on double bass. Two projects are being organized around the Ornette Coleman Quartet involving musicians who have been important in his career. On Friday the project is This Is Our Music Now", a performance with special guests bass player Charlie Haden and saxophonist Joshua Redman (the son of the late Dewey Redman who played with Coleman in the sixties and seventies). As the title suggests, Coleman does not only look to the past: his interest is still in innovation. Finally, there is a special performance with free jazz guitarist James Blood Ulmer, a follower of Coleman's harmolodics theory, and The Master Musicians of Jajouka, a traditional group of musicians from Morocco whose music has hypnotic rhythms. The title of this project is The Ornette Coleman Quartet meets Bachir Attar & The Master Musicians of Jajouka and James Blood Ulmer.